Looking For Dentures in Brisbane? Dentures are another name for false teeth. Discuss partial or complete dentures with your Brisbane dentist if you have lost your teeth due to decay or injury. Dentures offer a natural looking solution to enhance your smile. Dentures are artificial teeth that replace missing ones. False teeth are attached to a base, usually made of acrylic and sometimes metal plated. The base (plate) and false teeth together make up the dentures, and are custom made for each patient. Dentures are removable and can be taken out when eating or sleeping, if required. Your Brisbane dentist will discuss denture care with you. Dentures are not just reserved for older patients suffering tooth loss with age. Dentures are available to anyone who has suffered significant tooth loss. Tooth loss can happen with decay, but accidents can result in the loss of teeth, too. Even younger patients benefit from partial dentures when implants or veneers are not the best option. More cost effective than implants if significant tooth loss is present. Depending on the number of teeth you have missing, partial dentures or complete dentures can provide a natural looking smile. Partial dentures are usually suggested when one or more natural teeth remain in the gum. 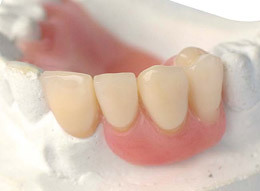 The partial denture replaces the gaps caused by missing teeth, and is attached to a flesh coloured base plate. A complete denture is a full set of false teeth that covers the jaw. Full dentures are required when patients have lost all, or the majority, of their natural teeth. If the few remaining teeth need to be removed before dentures are fitted, healing time is required for the gums. The complete denture in this case is called a conventional denture. Discuss how much dentures cost and the options available with your North Brisbane dentist. Rob Duhig Dental Practice is in the heart of Sandgate and offers a gentle, friendly service to North Brisbane patients. Call 07 3269 2443 or complete the online contact form to ask your denture questions.